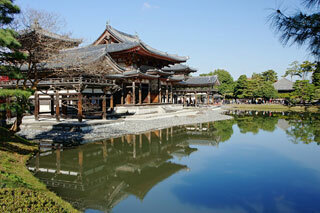 Byodo-in is a Buddhist temple in the city of Uji in Kyoto Prefecture, Japan, built in late Heian period. It is jointly a temple of the Jodo-shu (Pure Land) and Tendai-shu sects. This temple was originally built in 998 in the Heian period as a rural villa of high-ranking courtier Minamoto no Shigenobu, Minister of the Left. This article uses material from the Wikipedia article "Byodo-in", which is released under the Creative Commons Attribution-Share-Alike 3.0 License.